The Jets have a 2-1 record that feels like 2-8. It has been a wretched seven days for the Jets, who are dangerously close to sliding into the chaos everyone has been predicting for them for months. Their best defensive player — the most vital cog in everything that they do — is out for the season. The starting quarterback is falling apart, and the backup quarterback now has a ball-off-helmet GIF that'll be used to make fun of him for years. The third-string runningback is now a backup cornerback and isn't happy about it. (Or, as Mike Tanier of Sports on Earth put it, "[Joe] McKnight did intercept three passes in practice, including one by [Tim] Tebow, marking the first time a backup running back ever intercepted a pass by a backup fullback in the entire history of horrible ideas.") Lots of trouble going on right now. And yet ... the Jets are still 2-1, and in first place. It hasn't been an impressive first place, but they're still 2-0 in the division (with one road win), and those are wins you can't take away. They're banked. And it's a good thing. In the next four weeks, the Jets play San Francisco, Houston, Indianapolis and at New England. You have to think the Jets have to go 2-2 in those four games to stay afloat, to stave off the madness, to keep their season from careening out of control. Indianapolis (you'd think) would be one. They need to pick off one of the other three. San Francisco, before last week, would have seemed the least likely of the three; they looked like the best team in the NFL before Minnesota shocked them in Week Three. As Rich Cimini wrote yesterday, the 49ers are what the Jets want to be: a ferocious defense, a ball control offense, a game-manager quarterback who can throw the deep ball if he must. But the 49ers are a lot more of that than the Jets are. 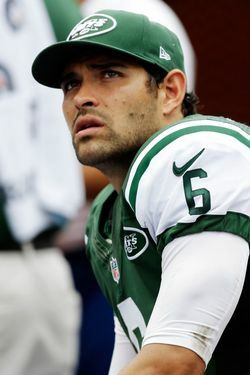 Of all the problems the Jets have, one thing that has sort of worked has been the Mark Sanchez–Santonio Holmes connection; that little slice of drama hasn't affected the Jets on the field at all. They'll need more of that Sunday, particularly because, without Darrelle Revis, the Jets may need to score more than they're necessarily designed to. The Jets won't be destroyed by a home loss Sunday; they'll have two more chances to pick off that win. But one gets the sense it will feel that way to everybody, regardless. 49ers 20, Jets 7.